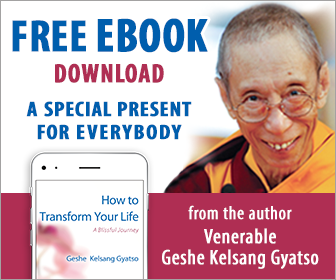 Extracted from Transform Your Life by Venerable Geshe Kelsang Gyatso. Renunciation is not a wish to abandon our family, friends, home, job, and so forth and become like a beggar; rather, it is a mind that functions to stop attachment to worldly pleasures and that seeks liberation from contaminated rebirth. We must learn to stop our attachment through the practice of renunciation or it will be a serious obstacle to our pure spiritual practice. Just as a bird cannot fly if it has stones tied to its legs, so we cannot make progress on the spiritual path if we are tightly tied down by the chains of attachment. The time to practice renunciation is now, before our death. We need to reduce our attachment to worldly pleasures by realizing that they are deceptive and cannot give real satisfaction. In reality, they cause us only suffering. This human life with all its suffering and problems is a great opportunity for us to improve both our renunciation and our compassion. We should not waste this precious opportunity. The realization of renunciation is the gateway through which we enter the spiritual path to liberation, or nirvana. Without renunciation, it is impossible even to enter the path to the supreme happiness of nirvana, let alone progress along it. Because my consciousness is beginningless, I have taken countless rebirths in samsara. I have already had countless bodies; if they were all gathered together, they would fill the entire world, and all the blood and other bodily fluids that have flowed through them would form an ocean. So great has been my suffering in all these previous lives that I have shed enough tears of sorrow to form another ocean. In every single life, I have experienced the sufferings of sickness, ageing, death, being separated from those I love, and being unable to fulfil my wishes. If I do not attain permanent liberation from suffering now, I shall have to experience these sufferings again and again in countless future lives. Contemplating this, from the depths of our heart we make a strong determination to abandon attachment to worldly pleasures and attain permanent liberation from contaminated rebirth. By putting this determination into practice, we can control our attachment and thereby solve many of our daily problems. For more information on renunciation, see the books The New Meditation Handbook and Joyful Path of Good Fortune.